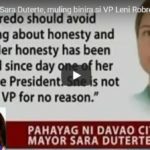 Vice President Leni Robredo was not invited to welcome any of the foreign leaders as they arrived in the country. This role is traditionally given to past Philippine vice presidents. The members of the Du30 Cabinet welcomed the world leaders instead. However, while the VP did not serve any official functions during the 31st ASEAN Summit, she attended the opening ceremony. Robredo also delivered a keynote speech at the ASEAN Business and Investment Summit in Solaire Resort and Casino. It’s not a big deal for her not having an official function. She would need a lot of time to prepare for Bongbong Marcos’ election protest against her now that the recount is due to happen anytime soon. [VIDEO]: Vice President Leni Robredo delivers the closing keynote at the ASEAN Business & Investment Summit held Tuesday, November 14. The vice president in Philippine politics has no specific mandate to perform in the Cabinet or in government. He or she normally attends ceremonial functions. Political tensions arise if the vice president maneuvers to undermine the president. It is detrimental if the VP supports the opposition. Complications happen if the VP intends to be president. The second leader’s every action perceives as partisan and can be harmful to the president’s political interest. Robredo urged ASEAN businessmen to help micro, small, and medium enterprises have easier access to fair trade and unclogged value chains during her keynote speech. The Vice President then met with representatives of women’s business organizations in Asia on the sidelines of the ABIS. Robredo, who resigned as Housing Czar currently has no Cabinet duties. She has all the time in the world to strengthen her legal defense in the election protest case filed by former Senator Bongbong Marcos. The President’s alliance with Marcos is just not helping her ultimate quest to stay in power. Du30 could have reviewed the functions of the office of the vice president already if the second most powerful leader after him is his preferred heir, Bongbong Marcos. He can begin by broadening the VP office’s mandate, identifying the government body that will be headed by the vice president, and specifying the duties that will be the basis to demand accountability from the country’s second-highest official. It’s the opposite now with Robredo. Her exposures are obviously minimized. She should already get the hint that the forces are working against her. Bongbong Marcos in 2015 urged the business sector and students to work together to prepare the country’s workers and businesses to face ASEAN integration. He stressed on the challenges to be brought by the ASEAN Integration program. Whereas Leni Robredo cited the stratified ASEAN economy: as wealth is divided among a few, the region continues to grapple with high poverty rates. 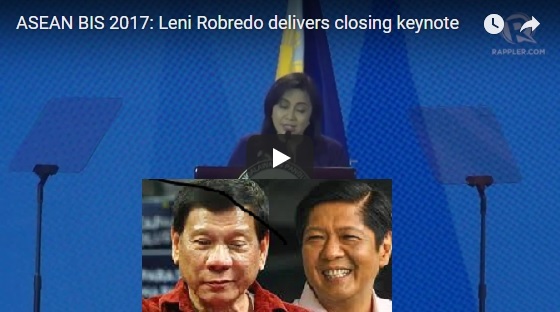 [VIDEO]: Philippine Vice President Leni Robredo delivers her keynote speech as government and industry leaders gather at the ASEAN Prosperity For All Summit held at the City of Dreams. In a speech before the Association of Business Educators and Students of the Philippines, Marcos reiterated: “Please be warned that the world out there is cruel and competitive. Better prepare for it now under the guidance of your schools and teachers, than learn the hard way later—when all will be too late.” He inspired educators to work hard that they can ensure that our graduates would have the skills and knowledge to match or even surpass those from other ASEAN countries. Marcos also added that students should be trained to study the markets and economies, consumer behavior, competition behavior, finance, and marketing. That includes taking up a comprehensive approach to monitoring the cost of doing business for increased competitiveness and profitability. The Vice President also elaborates that: “While the number of Asian billionaires grows, ASEAN is still home to many of the world’s poor. Small businesses do not progress.” She cited MSME sector’s problem with “middlemen” who take advantage of small entrepreneurs. Is she trying to say that the Westerners are better than Asians in business? Besides are Africa, Haiti, and Syria in Asia? They are among the poorest of the poor. ASEAN Message or Campaign Address? She then boasted on her zero hunger program during her time as Camarines Sur Representative. Robredo expounds that she encouraged the Department of Social Welfare and Development to tap local farmers as contributors for their feeding program. 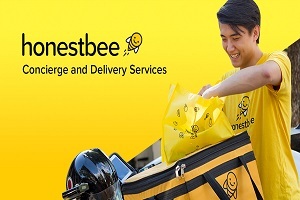 Is this issue appropriate to address ASEAN? A good leader must be someone who inspires people like the way Marcos did in his speech. Not find faults and then asks them to improve. The Philippine President said that the country’s South China Sea Dispute is between the Philippines and China. The US’s putting pressure in the region will not work. The Asian way is by means of bilateral talks – and he will not use ASEAN to push the nation’s claim. 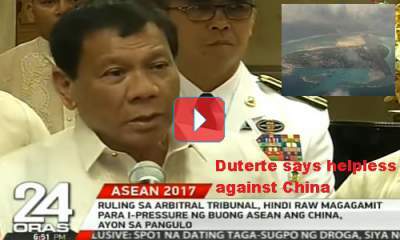 [VIDEO]: President Rodrigo Duterte made the comments on the eve of him hosting a two-day Association of Southeast Asian Nations (ASEAN) summit, and he confirmed he would not use the event to pressure China on its expansionism in the strategically vital waters. The President made it clear that this time, the dispute will not be mentioned in the Association of Southeast Asian Nations or ASEAN summit. 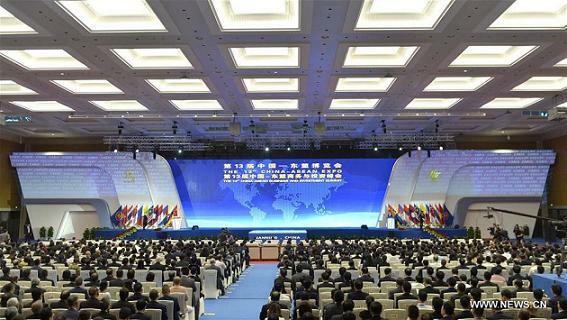 He stressed that he would not use the event to pressure China on its illegal expansionism in the strategically vital passageway waters. China turns reefs and shoals in some areas claimed by the Philippines and other nations into artificial islands. It also installs military facilities there. China’s reclamation rattles other claimants which include ASEAN members like Vietnam, Malaysia, and Brunei. The Filipino leader could very well take advantage of the hosted event – but opted to keep the friendship with China. The United States has criticized China’s construction work. It warns against militarization in the waterway where $5 trillion in annual trade passes. 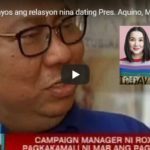 They claim that it’s the freedom of navigation that they are after and would back the Philippines should the Filipinos insist on their sovereignty rights. Du30’s predecessor, Benigno Aquino III challenged China by filing a case at the Hague, a UN-backed tribunal to outlaw Beijing’s claims. 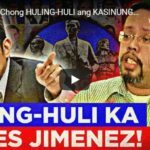 The tribunal last year ruled largely in the Philippines’ favor but instead of helping to ease the troubles in the area, it has created more tension that can ignite China War. Therefore, the president concentrated more on economic ties with China and the latter supports the country’s drug war and infrastructure projects. ASEAN leaders might be quiet on what they think about the Philippine leader’s drug war that is condemned by some Western heads – but one thing is certain, they have found a leader that can voice out ASEAN sentiments to the world without fear. [VIDEO]: President Rodrigo Duterte is set to enjoy much-wanted foreign support for his deadly drug war when he hosts Southeast Asian leaders at a Manila summit this week, observers say. 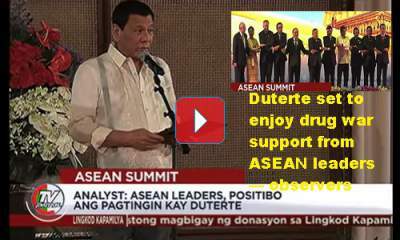 Du30’s’s unpredictable foreign policy is also another focus at the Association of Southeast Asian Nations (ASEAN) event. There is a confusion surrounding his approach to Chinese expansionism in the West Philippine Sea or the South China Sea. That area is closely watched for how. He has shocked the world on his brutal tirades against the United States and the United Nations. This ASEAN Summit is his first major diplomatic event. The mood is likely calmer in Manila for the two-day annual event. The President should enjoy drug war backing from most of his guests and observers for a change. “I sadly expect Du30 e will promote his drug war because he knows there will be no contrary words from the other ASEAN leaders,” Phil Robertson, deputy director of Human Rights Watch’s Asia division, said. Thai military junta chief Prayut Chan-O-Cha, Sultan Hassanal Bolkiah of Brunei, the leaders of Laos and Vietnam, Cambodia’s Hun Sen, a former Khmer Rouge cadre, and Malaysian Prime Minister Najib Razak are among the heads of states that convene in Manila.